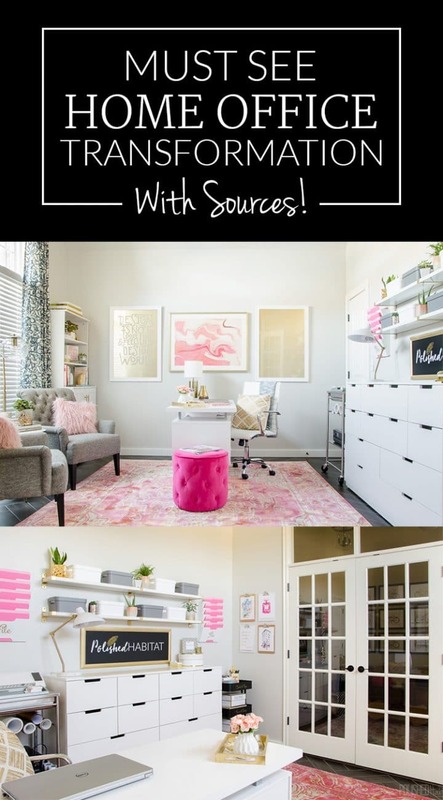 You are here: Home / Space Reveals / Functional & Fabulous Office – It’s DONE! 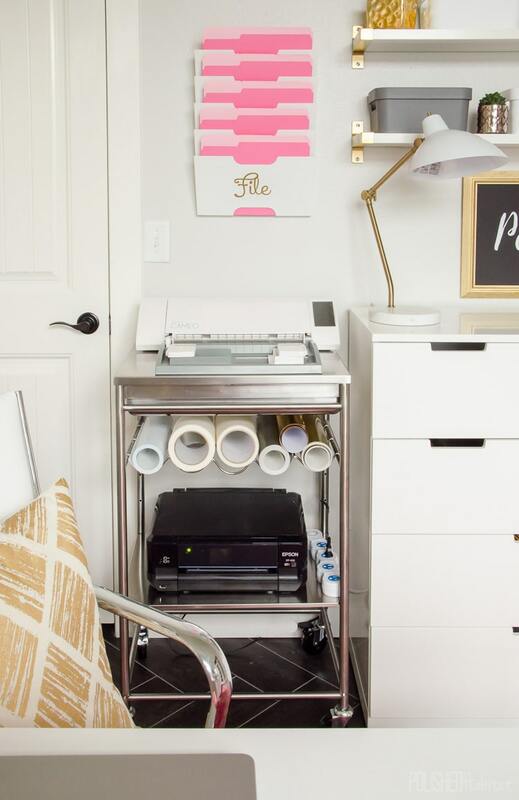 Functional & Fabulous Office – It’s DONE! I can’t believe it’s real! My home office is totally unrecognizable compared to 5 weeks ago when I started the One Room Challenge(ORC). Just like the first 5 times I took on the ORC, our house emerged this period of chaos looking better than I ever dreamed. Equally important, the office is already functioning exactly the way I envisioned. I’m a big advocate of your home being a retreat, feeling like you, and working for you. This room checks all three boxes in a way it never has before. 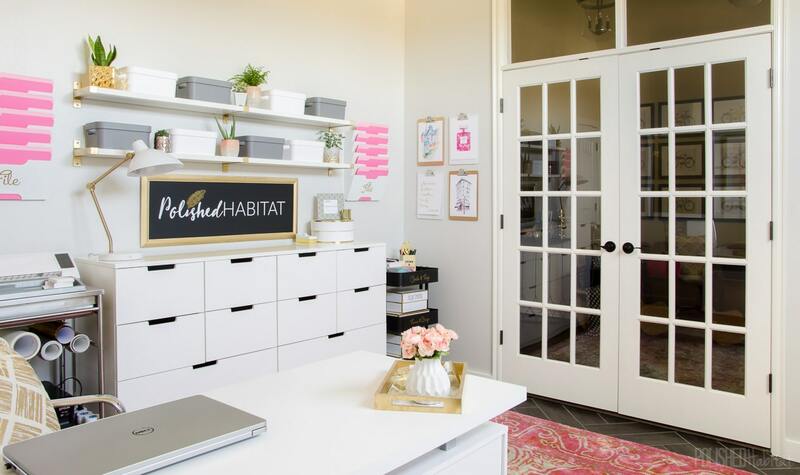 PS: If you’re a new reader, welcome to Polished Habitat! You should head back to week #1 to start at the beginning of this 6 post event hosted by Linda from Calling it Home. The short version is that 200+ people are making over one room in their house. Each week, we all shared progress updates until the final reveals today! I’m one of those crazy people who take part in the event each spring and fall, even though it usually makes me cry. Let’s do a quick history of the office I tackled for this challenge. A few years ago we painted it gray and added some IKEA bookcases. Then last year, we rearranged everything and added an awesome gallery wall of gig posters over my husband’s desk. The problem was that my husband is rarely in the office, and I work there full-time. With only one desk needed, I came up with this plan. And today…drumroll…it looks like this! When you come into the office and look right, we’ve got one of the old bookcases. I swapped out the backing to subtle gold dots using wrapping paper. We also swapped out the wimpy pulls using the same pulls and paint we used in the closet and pantry. My husband is known for his ORC art projects and I fit one in this space as well. 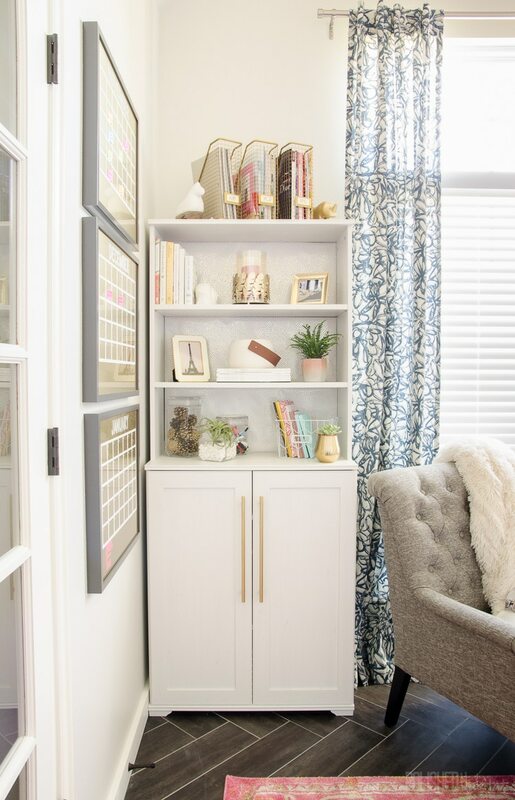 I think the bookcase backing will change again when I find something I REALLY love that works in the space. This isn’t bad, but I’m not crazy about how shiny it is in person. Spinning around from the bookcase, the “function” side of the room turned out prettier than I expected! Look at all this glorious work space! It has already come in handy. Right behind my desk, I fit in a kitchen cart that holds the Silhouette, vinyl rolls, AND the printer. This is probably the least pretty picture, but has already been so much less frustrating than the old set up. I’m pretty excited about the file storage on the wall right behind me too! Ah, sweet, sweet symmetry. The right side files will be for personal paperwork while the left is just business. I keep adding plants to my collection and feel like they are going to be VERY happy on these shelves getting some sun every day. Update: Since the post, I upgraded to a larger printer and from Silhouette to the Cricut Maker. Luckily the space was flexible enough that everything still looks great! 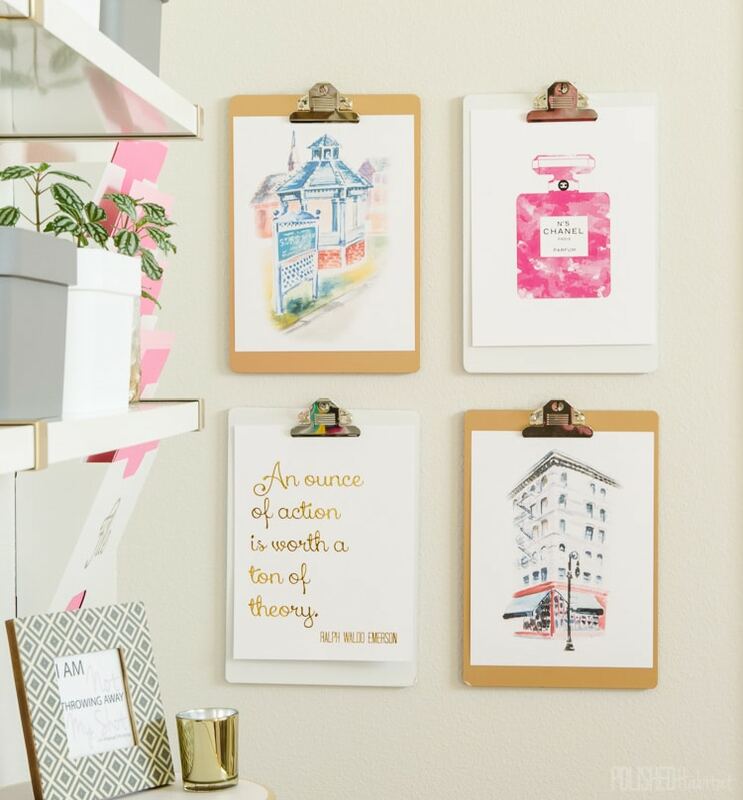 When I found white and gold clipboards in the Target Bullseye Playground last week, they became the perfect interchangeable art wall. 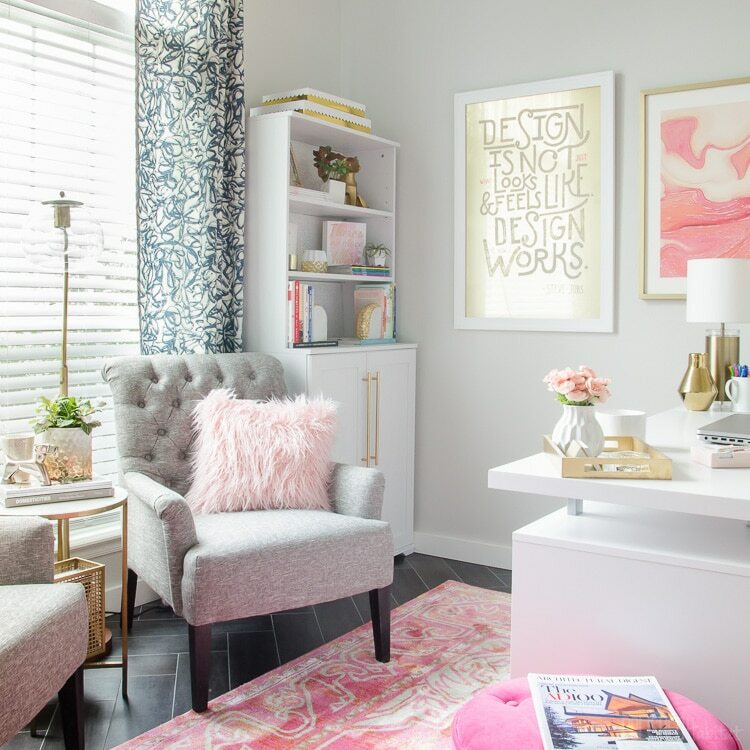 The pink Chanel print by fellow One Room Challenger Foxy Oxie matches the room so well! 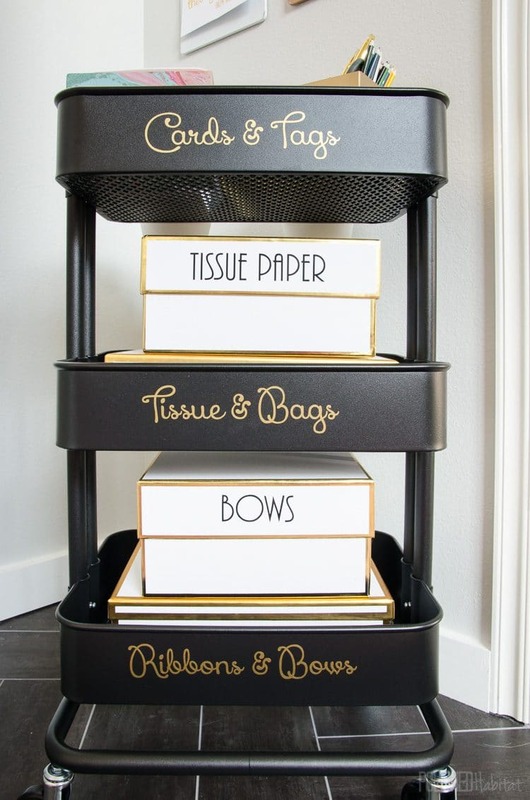 Tucked in between the dresser and clipboards, I had just enough room to add a rolling gift wrap cart. Isn’t she pretty? I’m so glad we got the art hung in the entryway. It would have been sad to have a view of a blank wall. Boy, do I want to paint the front door now! Who picked brown!?! I LOVE my new three month dry erase calendar system! Remember the window stress? I am thrilled we went with the Ultimate Header and SelectBlinds. SelectBlinds totally saved the day! I can tilt the blinds for the right amount of light during the day. Then, they get closed when the sun starts blazing in too much. I really like that there is a single smooth header running across both blinds. It’s nice not to be on full view of the neighborhood if I’m working in the evening too. Here’s one final look coming straight in from the doors. I don’t know if I ever mentioned the ceiling fan swap. I found a mod white fan that works with the room so much better than old one. Gray Chairs – I lucked into mine at Tuesday Morning, but found a similar color and shape on Overstock here. 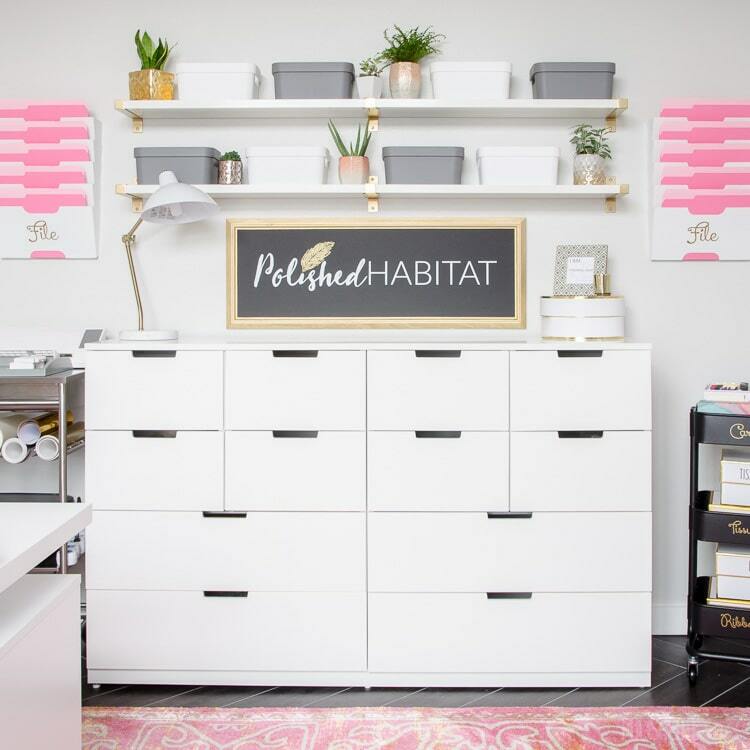 In addition to Minted & SelectBlinds, HomeRight was a great One Room Challenge partner. As you can see by all the gold boards, my spray shelter was in big use the last couple weeks! We’re so thankful Linda from Calling it Home started this event and let’s us join the fun. It’s such great motivation to make fast, bold decisions and get spaces finished. Ready for more inspiration? Here are the other rooms I’ve completed during the past One Room Challenges! I love love love how everything turned out!! The space is so soft and chic and is just fitting for a lady. The colors blend together so well. Not surprised as all your other makeovers are just as awesome! How nice it must be to have such a lovely space with lots of storage and just the right amount of sun and light coming through. 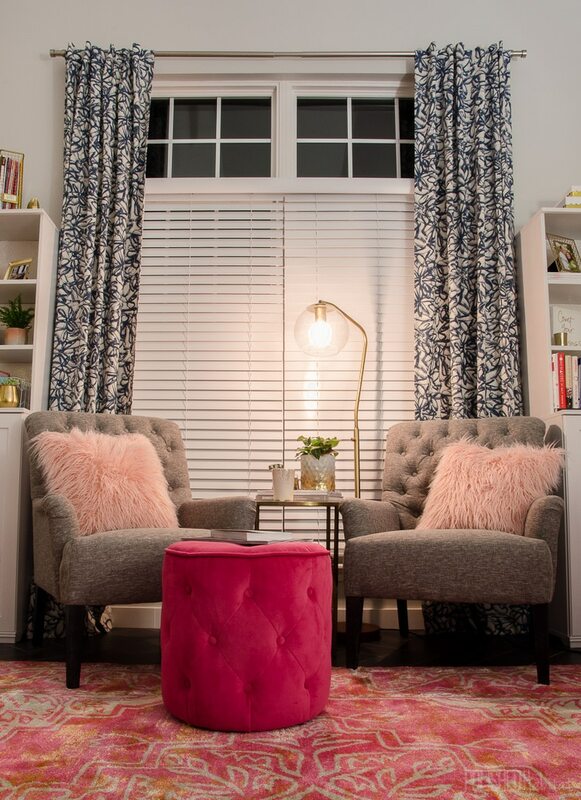 The curtains are beautiful – always have a hard time finding ones I like. And those throw pillows – I wondered why I recognize them:)) Oh, your hubby is so talented, I love this other piece of art in your office. What a pretty space! I would love to work in a office like this. Love all the gold accents. YES!!!!!!! This is fabulous!! 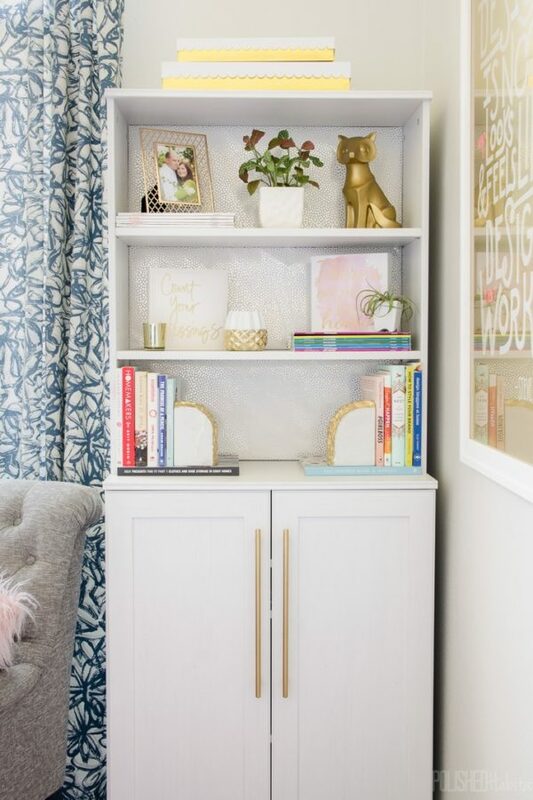 Another amazing room transformation. 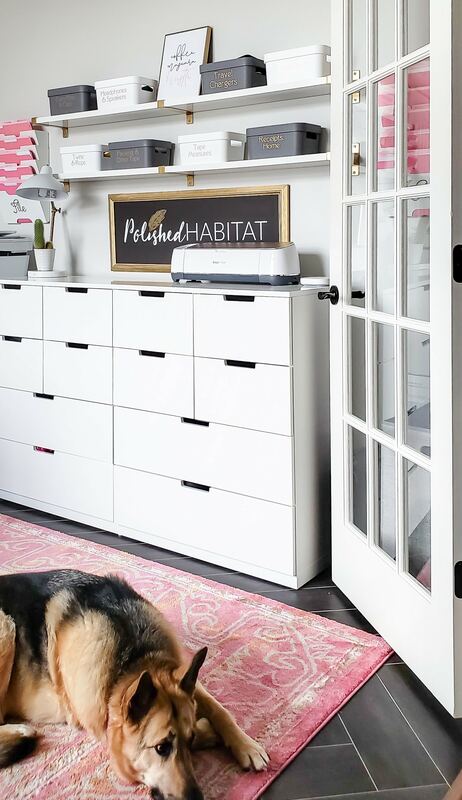 I adore the prints and the cabinet drawers are super! 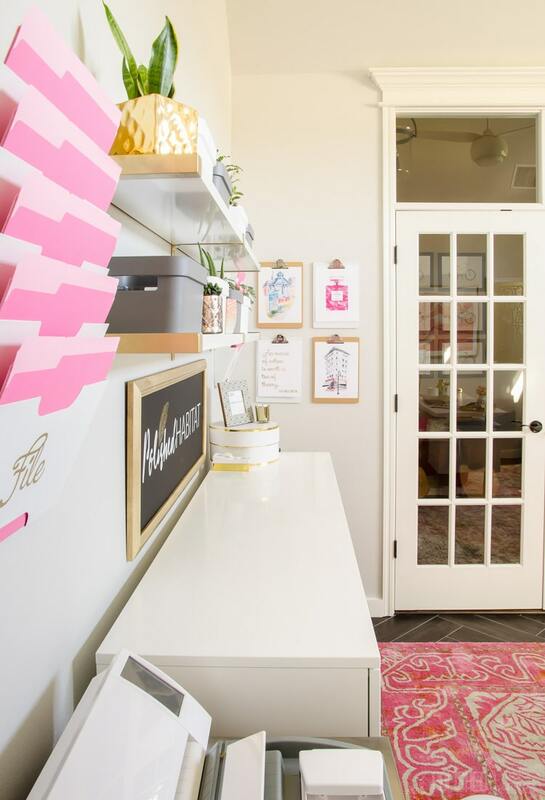 Oh my gosh, this whole room is like a dream office. Wonderful job! 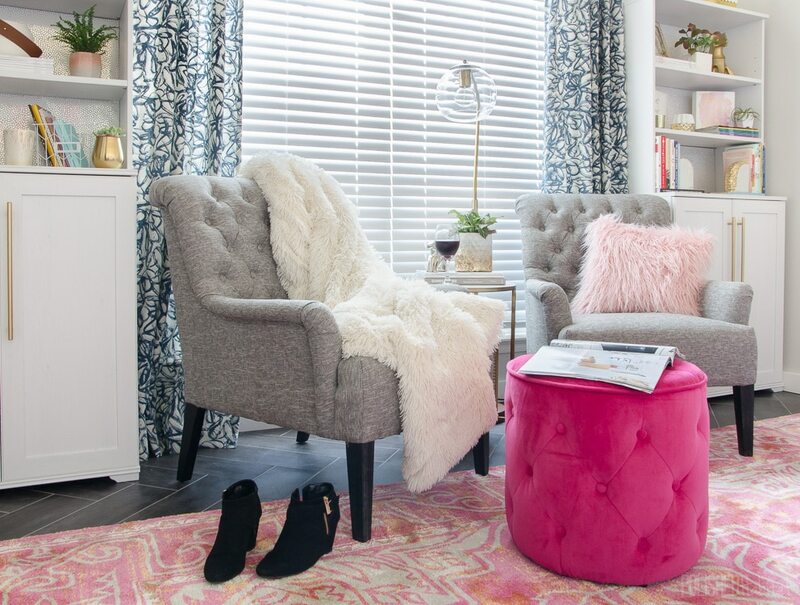 Okay, I told you I loved the “before” room, but I also love your fantastically feminine makeover! 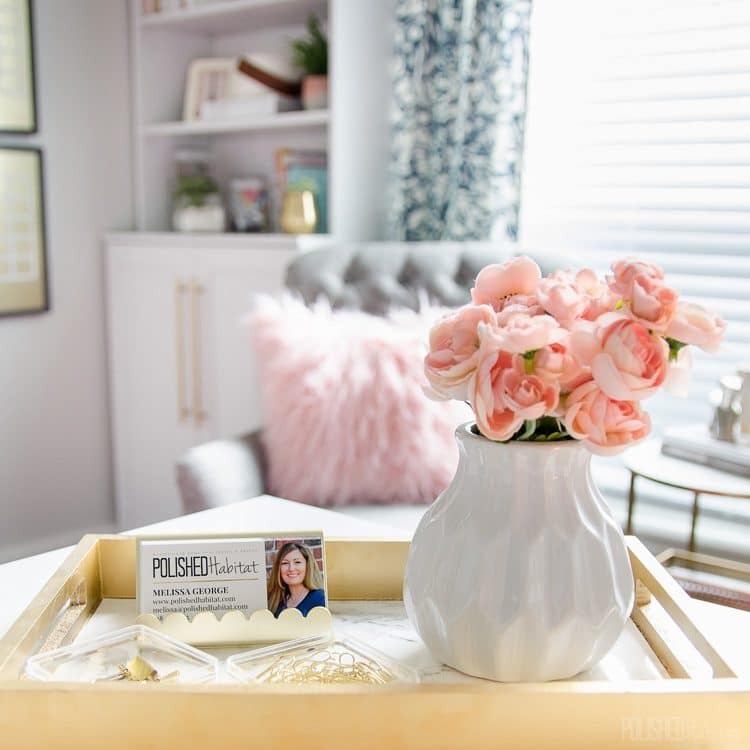 This looks like such a nice place to work, Melissa! Nice job!! I loved the finished product! Beautifully executed! Do you remember the name of the rug? The link no longer works. I love every single thing!! This is my inspiration room!! Do you happen to remember the name of the wall color? Thank you! The walls are Sherwin-Williams Repose Gray, mixed at 50% strength. We used the leftover paint in our guest bathroom so you can see what it looks in different lighting here: http://www.polishedhabitat.com/2017/guest-bathroom-organization/ Still get a tester since colors can look different on different monitors and in different rooms. We tested TEN light grays/whites for the office before we figured out this was the magic color for us! Love your office!!! 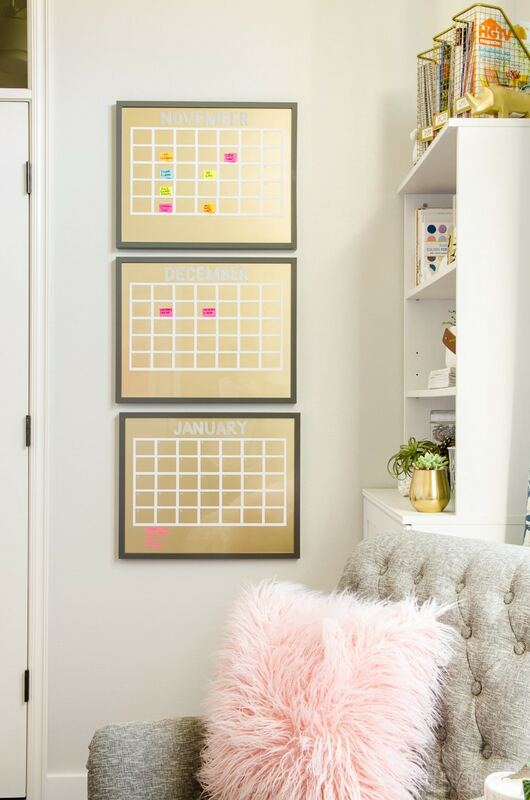 Were the large frames you used for the dry erase board also from ikea? If so, which frames were they? Hi Nika, Those ones were from Hobby Lobby. Just make sure you wait for the 50% off sale! I found this on Pinterest and it is one of the most beautiful office spaces I have seen! Amazing job, I love it! 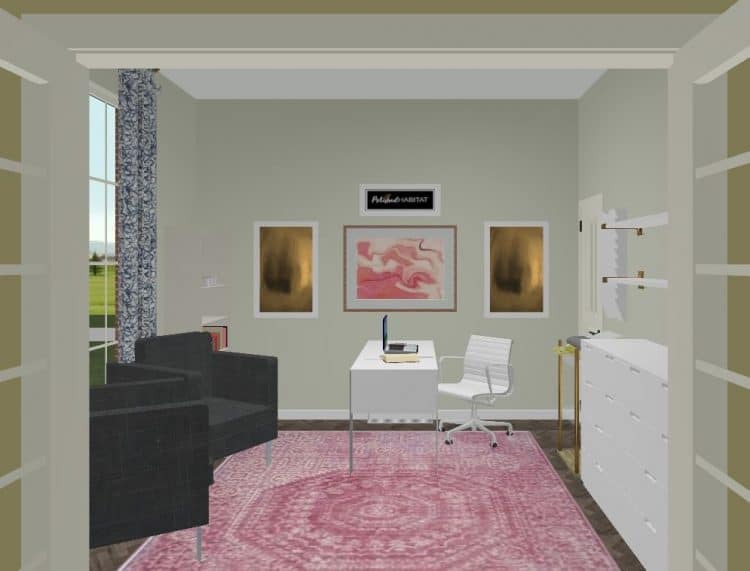 I Needed some inspiration to design my office in our new home that will be in the formal living room space. Thank you for showing the entire room. So chic and sophisticated! Love your wall color in the new office! Can you share what color that is? We used Sherwin-Williams Repose Gray, but lightened to 50% (any Lowe’s or Sherwin-Williams store can do that). It does look very different in different rooms, so pick up a sample before buying a gallon! Amazing! Just clicked over from Pinterest because I love that wall color! Do you mind sharing what paint you used?? Hi Crystal, We used Sherwin-Williams Repose Gray, but lightened to 50% (any Lowe’s or Sherwin-Williams store can do that). It does look very different in different rooms, so pick up a sample before buying a gallon! Hi! I love your office and it is a great inspiration to do mine. What paint colour did you use? 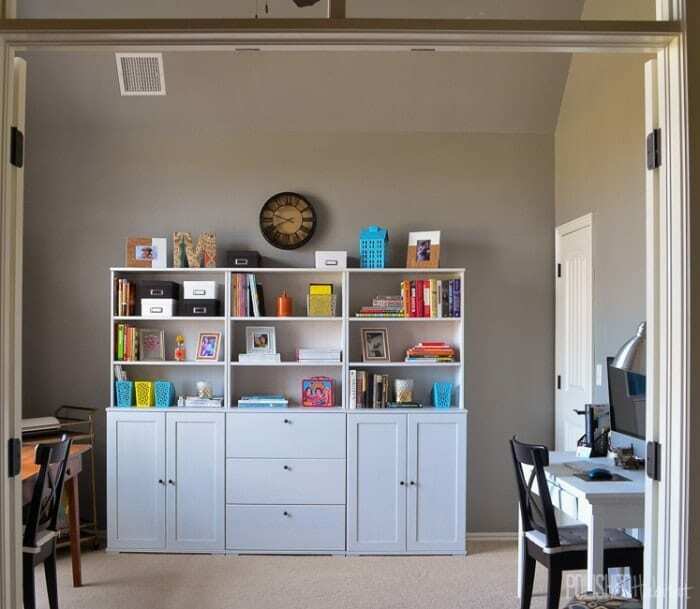 Hi Liliana – We used Sherwin-Williams Repose Gray, but lightened to 50% (any Lowe’s or Sherwin-Williams store can do that). It does look very different in different rooms, so pick up a sample before buying a gallon! 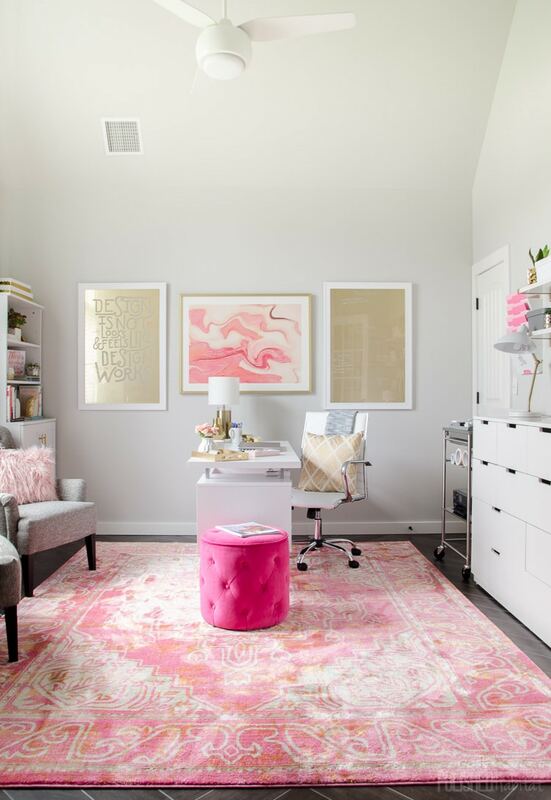 I have gone through so many images as inspiration to redecorate my home office and always come back to this one. It is so beautiful. I even looked for the rug at Wayfair but cannot find it. Can you share the name? One question about having the desk away from the wall. What is the trick to hide the cords? Thank you for sharing this beautiful project! Hi Liliana – I’ve checked everyone and no one seems to carry the rug anymore. So sad! It’s made by Bungalow Rose and they do have some other pretty options. For the desk, I got lucky and there is an outlet on that back wall (under the pink abstract art). However, I also unplugged everything for the reveal photos. I considering drilling a hole in the desk to run the cords under the desk and then up to the top, but since I used a laptop and end up working part of the day in the office and part other spots around the house, I’m constantly plugging it in and unplugging it. For laziness sake, I just leave the cord running on top of the desk and to that wall outlet. Oh my this is stunning! What a beautiful job you did. Pink and white and gold – love it! 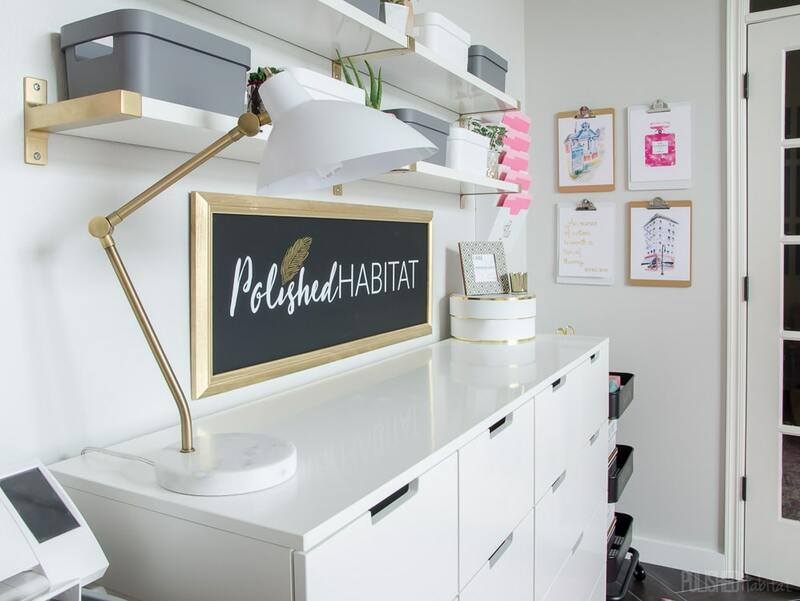 Hae to share a funny story – I got a new office space in our house when my boys outgrew the need for a playroom and was so excited to set up my white office (that’s all that filled my Pinterest Office board). I purchased white Ikea furniture and shelving to put in there and ended up getting rid of it and switching to dark wood. As much as I LOVE the look of a white office, I apparently just can’t work in it. 🙁 I am envious of your beautiful space nonetheless and definitely will use some of your ideas. Thank you! And that is interesting about your white office! I can see it being easier to focus in a darker space though, so maybe that was part of it? Your work is so motivating. Thank you for sharing your talents and thought process with us! So beautiful AND functional. I love it!! 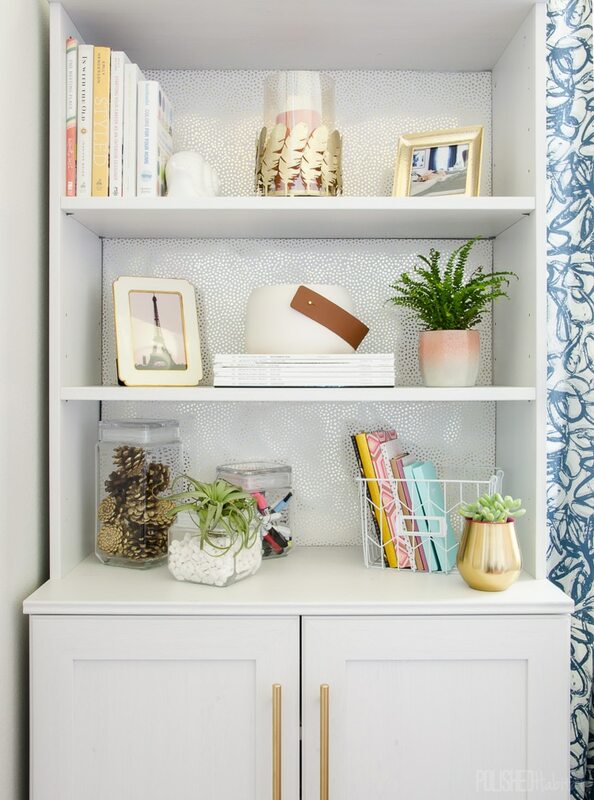 Where did you find the deep, rectangular, gray storage bin that is next to your shredder in one of your more recent posts? I think it is umbrella storage? I am looking for a deep tote like this for kids storage; light sabers, etc. Thank you! You are so inspirational!